Penny Dale was born in Abbey Road near The Beatles’ studio, but grew up in Ottery St Mary, England. Her first school was so small that all the children were in one classroom, and even that wasn’t full. She drew and made things all the time and her dad showed her how to use a hammer properly, something she’s still proud of. She made Plasticine models of everything she could think of. When Penny was very small, she found her parents’ folios from a time when they both went to life drawing classes in London. She remembers being immensely impressed by their drawing, and even though she was very young, she knew she wanted to draw like that one day. At her junior school she was encouraged to draw pictures to complement written work, and this she loved, though this was not encouraged later on at secondary school, which she found puzzling. However, she still managed to illustrate work in some subjects, like diagrams in science and maps in geography, and once she even made a lift-the-flap Norman castle in history. After secondary school, Penny studied at Bristol, then took a gap year to work with the Arts Workshop in Bath, making props and costumes, acting, and counting the takings on foreign tours. Later she studied for a degree in fine art at Exeter. After college she began working for a time at the Northcott Theatre, designing and making costumes and props again, before she and her husband moved to Northumberland to work on renewable energy projects and graphic design. Their daughter was born in Hexham, and a friendship developed with an artist Penny met at childbirth classes, which led to shared daughter-minding, making time for painting, drawing, and print making. A year later Penny moved down to South Wales, where her husband took up a lecturing post in design. It was there that she started to write and illustrate children’s books. 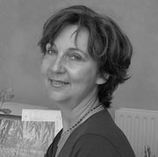 Today Penny is an internationally-known, best-selling children’s book artist and author and has sold more than 4 million books, with editions in more than twenty languages. Her much-loved picture book Ten in the Bed sold almost two million copies worldwide. Her other titles have also met with great success: Once There Were Giants, by Martin Waddell, and Bet You Can’t were included in the UK SATS booklist for many years, and Once There Were Giants was chosen as one of the Guardian’s Best Children’s Books Ever. Rosie’s Babies, by Martin Waddell, won the Best Book for Babies award and was short-listed for the Kate Greenaway Medal in 1990. Night Night, Cuddly Bear, also written by Martin Waddell, and Ten in the Bed won the Oppenheim Toy Portfolio Award in 2001 and 2002 respectively. Jamie and Angus, written by Anne Fine, won the Boston Globe–Horn Book Award in 2003. Penny Dale’s work also includes Princess, Princess, The Boy on the Bus, Jamie and Angus Together, and the Dinosaur series for Nosy Crow and Candlewick: Dinosaur Rocket! (2015), Dinosaur Rescue! (2014), Dinosaur Zoom! (2012), and Dinosaur Dig! (2011).